Since we don't have a Clarks store in Vienna and usually just a small collection in shoe-stores, I wanted to try my luck in Dublin and BINGO! They didn't have my size in the first outlet I tried, either, but I got the sales person to call another branch, where a size 5 was waiting to be snatched up by yours truly. 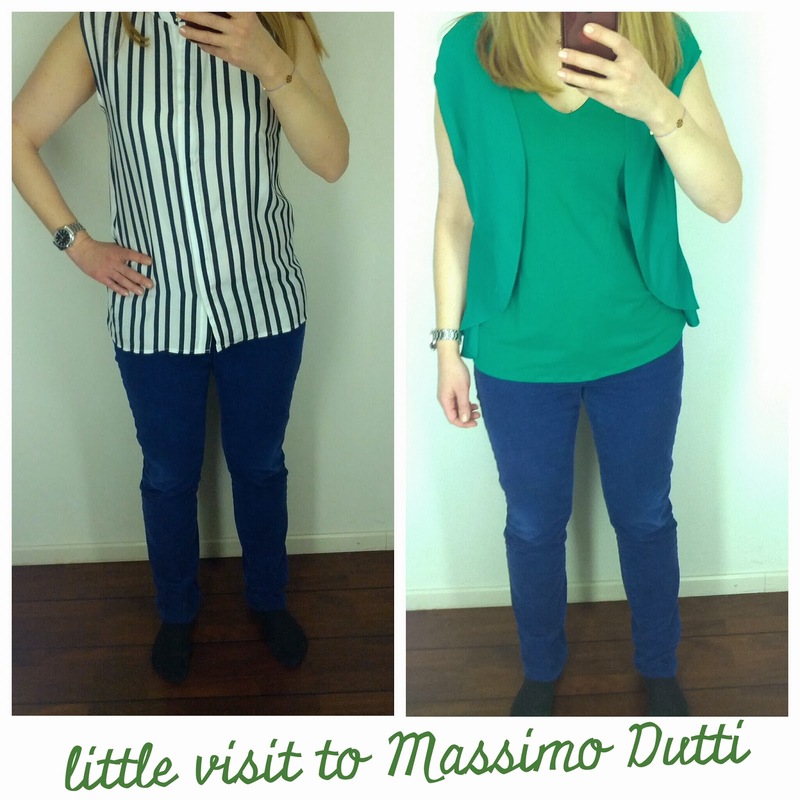 I love the combination of the 3 colours and they are really comfortable, too. Mission completed. The picture doesn't do it justice, nor does the one on BREE's website - it is such a vivid blue with a high percentage of white in the mix. Off to Dublin tomorrow, with a stopover in FRA where I bought another of those business travel bags last time. Wish me luck. I've been in Hamburg since Monday with a tightly packed agenda. My manager, who is an amazing host and always eager to entertain his team, made sure the evenings didn't get boring either and also organised a "Dialogue in the Dark" session for the 5 of us. Even though I had heard of this activity when it was popular in Vienna a few years ago, I had never given it too much thought. It really is some experience to walk around in the PITCH DARK when all you have to guide you is sound, smell and your hands and feet. I was always concerned I'd end up groping somebody in their private parts or something, but thankfully that didn't happen and we are still talking to one another. Despite said tight agenda, I still managed to squeeze in a bit of retail therapy. More on that coming up. Speaking of darkness, I love how well the Speicherstadt (warehouse district) came out in the night shot above! I justified my order that I just stocked up on stuff I *needed*. Ultimately, it turned out cheaper, as one of the items wasn't in stock and EUR 49 was refunded to my PayPal account. I was anxious that this meant the loss of the precious goodie box, but it didn't and I got it for "only" 101. Yay! 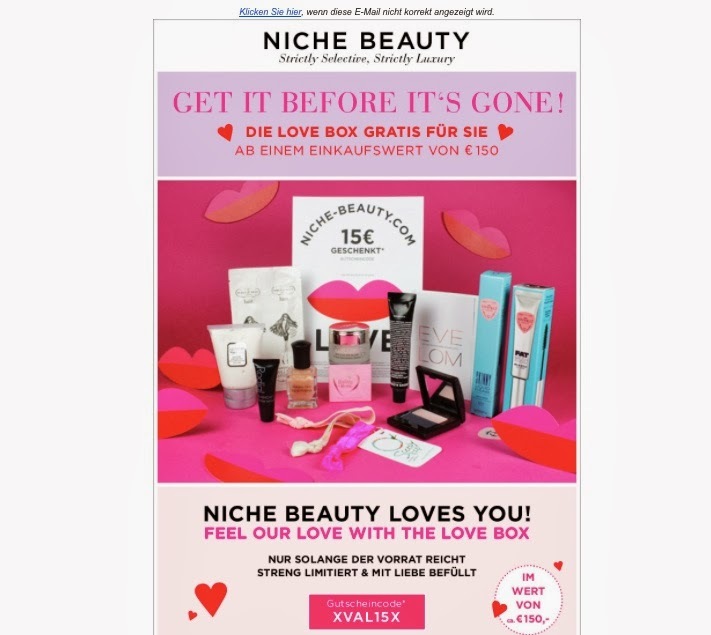 When I returned to the office this morning, my Niche Beauty order was waiting for me together with the Valentine's Day themed February glossybox. Hello, pink overload! I can't wait until I've played around with every single item. Entertainment on Valentine's Day = check! Hello from Zagreb, where my nice hotel welcomed me with a warm chocolate chip cookie and "sweet dreams" embroidered pillow. I arrived tonight and was at the airport pretty early so for the first time ever checked out the (Star Alliance) lounge near G-gates. Pretty much all the men were glued to the flatscreen tv, watching some broadcast from the Winter Olympics, while I opened my computer and pretended to be busy, simultaneously testing both cakes that were on offer (yum, yum, both)...The reason why I retraced my steps one level down to the lounge was because I already did some damage at Duty Free 2 minutes after entering the non-Schengen departure area. I seriously was not planning to buy anything, but when this beautiful Codello scarf (90% wool, 10% silk) in exactly the same blue (darker in real life than in the picture) as the Tommy Hilfiger bargain I made at P&C in KLU on Saturday caught my eyes, I had to stop. Thanks to the lovely lady at the counter offering me a Heinemann loyalty card, I got it for a further 10% off the sales price, eventually paying 27 EUR instead of 79. Not bad! The trousers, by the way were originally 99 EUR, but I bagged them for 39. They are seriously lovely and even my Mum, who is only too aware of my overflowing wardrobe(s) and often tries to curb my enthusiasm when it comes to pouncing on bargains, agreed that they are a great fit and I had to get them. I'll try to be good at least until my return. I am pretty impressed with the outcome and love the fit as well. She reasoned that probably not even charities would be delighted about a donation of bobbly jumpers and it was better to cut them up and make something out of it that actually gets worn, if only at home. On top of the nice things I got from my friends (and I am looking forward to opening more pressies when I go to KLU on the weekend), I also found some things to treat myself. Because, you know, I'm worth it. Some of them were on sale, others not. I am not planning on any more splurges in the near future, but then again I have business trips to potentially dangerous places lined up. I really can't complain about the presents I got for my birthday this year, and I haven't even met all potential gift-bearers... On my actual birthday, I went for an age (and killer cold) appropriate dinner with some friends and my favourite cousin and here's a highlight of the lovely gifts I got then plus from 2 other friends on the weekend. Can you see a theme to the "girly gifts" in the still life below? So as I said: not complaining here! Hi, my petals. I am feeling semi-human again and my cough is not quite as fierce as it was the past few days when I was this close to Googling "symptoms of pneumonia". Enough of being sick, old and decrepit, let's move on to London where I spent last Wed. - Sat. I would have stayed until Sunday night had it not been for the fact that I had an early flight to Sofia to catch (from Vienna) on Monday morning. Unlike Vienna, London was warm and sunny most of the time I was there. Here's a view towards the river from right outside the Tate Modern, my #1 must-visit place every time I'm in London. Let's just step back to admire this cool t-shirt that is SO me! It is from French Connection, a brand that I used to adore when I was younger. Lately, I haven't been paying it too much attention, but they are instantly back in my good books with the #selfie t-shirt that I already wore to work last Friday. With it, I bought a pair of blue suede shoes (hah! song!) from Clarks that are really comfortable with a bit of a heel. I had been looking for a pair like these for quite some time. I was wondering where the wardrobe was and others obviously had before me as there was a little plate on the panelling above the bed saying "wardrobe and hairdryer" and lo and behold, when you open it, there is a hairdryer and a tiny space with hangers and a mirror. Fancy. Not. Needless to say, there was no desk or chair in that cell.